Move aside, Ping An Finance Centre. This past Monday, a groundbreaking ceremony was held for what will become the tallest building in Shenzhen and possibly China – the Shimao Shenzhen-Hong Kong International Center in Longgang District. The building, planned to soar to heights of 700 meters, could also be crowned the world's second tallest tower. Whether or not it's outpaced, it will certainly top the Ping An, currently the third highest on the planet, by over 100 meters. The Shimao Center is also expected to become a prized symbol for the Greater Bay Area – which encompasses Hong Kong, Macau, Shenzhen, Guangzhou and seven more Cantonese cities – by beating out China's previous record-holder, the Shanghai Tower (632 meters). Given the importance of the estimated RMB50 billion project, province and city officials alike attended the groundbreaking this past week. Besides finally putting remote eastern Longgang on the map, the Shimao Center will also house international conferences and exhibitions, a performing arts center, a hotel, an international school, office space and more. All of which goes to show that Shenzhen hasn't yet lost its taste for great heights: in 2016, the city completed more skyscrapers than the US and Australia combined. 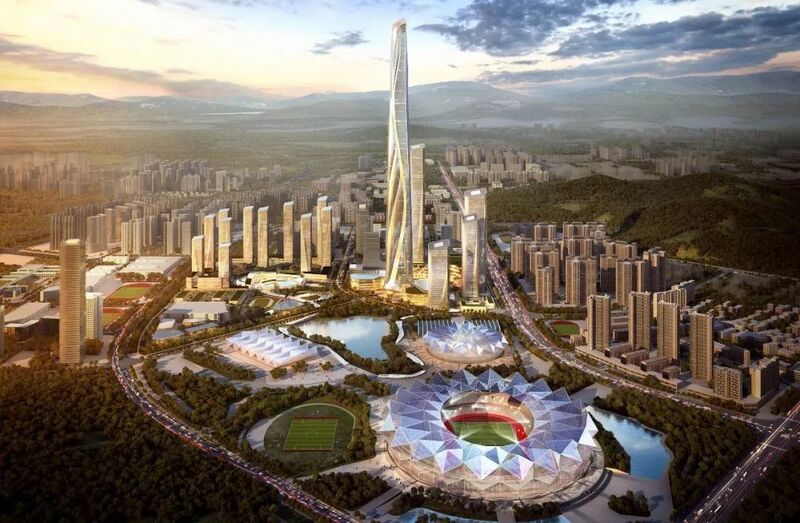 Even the Shimao Shenzhen-Hong Kong International Center may lose its crown not long after completion: as early as 2016, Shenzhen's Luohu District announced plans to raise a 739-meter-high tower not far from the KK100, a former record-holder. UPDATE (March 29, 2018 at 7.27pm CST): A graphic that inaccurately stated the height of Dubai's Burj Khalifa, currently the world's tallest building, has been removed from this post.